Besides a few exceptions all our games at Game Station, Cleopatra Games and Devilish Dream are connected to a dropping score jackpot. The concept is simple: Score at least the score shown on the dropping score jackpot and you will win the prize shown. In case you don’t win, the score will be lowered, making it more easy to win it in the next game. There is a different jackpot for each buy-in prize. So if you play e.g. a L$50 game, you can win the jackpot connected to the L$50 games. * You have to score above 98722 to win it. 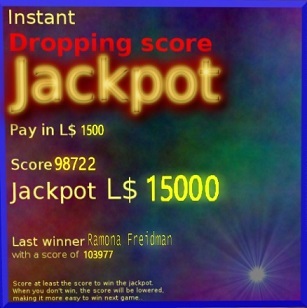 You can take advantage of the fact that each game has its own dropping score jackpot by playing the game with a pay in price of which the dropping score jackpot shows a relative low score. It is always good to get a high score and win the game. When you do so with a score high enough, the dropping score jackpot will give you an extra prize! 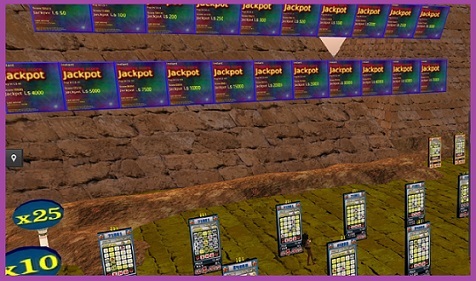 Watch local chat, each time you finish a game, the jackpot will send a message. So you know the score without having to zoom in and out on the jackpot after each game. * It is always wise to first aim on winning the game. On each game, scores can only go up, never down. When your score is high enough to win the game, you can aim for the jackpot. * Each buy in price has its own dropping jackpot score. You can have an advantage playing that buy in where this score is the lowest.